I’m kind of getting a kick out of my weekend sewing projects – I don’t know how long I can keep it up (there are only so many fabric bags one person needs), but it’s a fun way to spend a naked Sunday afternoon. It’s an extremely lightweight white cotton circle skirt with green polka dots, hemmed with bright pink bias tape and topped with a wide elastic waistband. It turned out pretty good once it was finished, but it’s still too big. I can wear it, but I’ll be the one in the corner hiking her skirt up every two seconds in a somewhat moot attempt to remain decent. 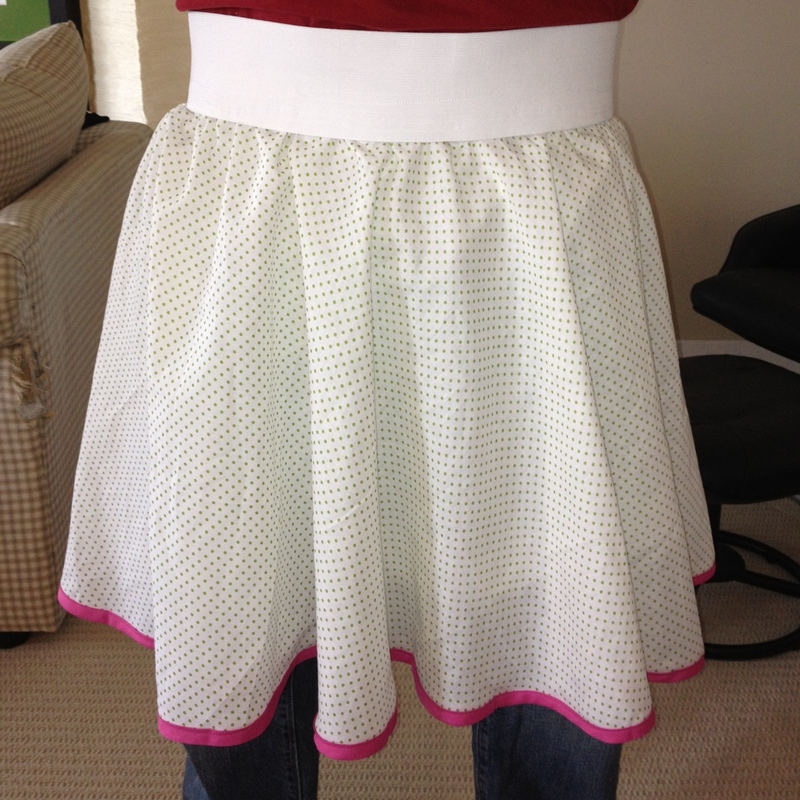 I wanted to add contrasting green/white pockets, but they’d look funny on a circle skirt. I’m kind of in love with the idea of brightly coloured skirts with contrasting hems and pockets, but first I need to find a skirt pattern that I would actually wear but isn’t a circle. I think I may look into the noble square, and see if we can’t come to some sort of agreement. I did try one other project yesterday, but I failed it spectacularly. Ironically, it’s supposed to be the easiest among all the patterns I have, yet I fucked it up really badly. I seem to be in the “advanced beginner” stage – I’ve made a couple of relatively complicated (for an idiot, like me) things, but the very simple “cut here and sew a straight line” stuff is totally beyond me. I am a Lady of Leisure for three more days – let’s see how much trouble I can get into. Would you consider selling your surplus bags? I could do that! I could also make more – Shan’s already asked for one, and I could use the practice :D Email me if you want – kimli at this domain dot com!